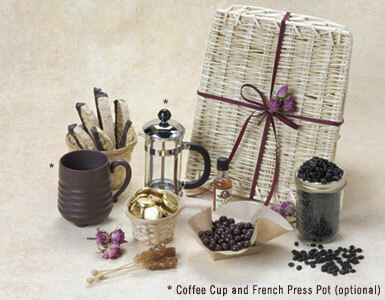 Our coffee hamper is the perfect gift for the coffee connoisseur. Two half-pounds of whole beans come in vacuum sealed pouches to preserve their freshness. They are accompanied by traditional Italian Biscotti, orange ginger chocolate wafers, two small bottles of Italian flavoring syrup, cinnamon sticks, four sugar swizzle sticks and chocolate covered espresso beans. Available in regular and decaffeinated. To find out more about tasting coffee, please take a look at our Guide To Coffee. We offer coffee gift baskets, gourmet coffee gifts, coffee and cookie baskets, gourmet coffee gift baskets, espresso baskets, whole coffee beans gifts, and whole coffee bean baskets. We promptly deliver your gourmet coffee basket and coffee gift to your home or office in Beverly Hills, West Hollywood, Santa Monica and greater Los Angeles area.